Thanks to the Internet and social media, customers are more savvy now than ever before. Although this sounds like a good thing, the net result is an increase in stress for frontline customer service professionals. According to Newsweek magazine, the stress level of consumer services professionals is comparable to that of air-traffic controllers and police officers. In short, the role of customer service now ranks as one of the 10 most stressful jobs in the U.S. In this keynote Myra Golden reveals that extremely difficult customers are determined to force corporations—via the customer service professional—to give in to the consumer demands—reasonable or not. This means the customer service professional must develop a response plan. 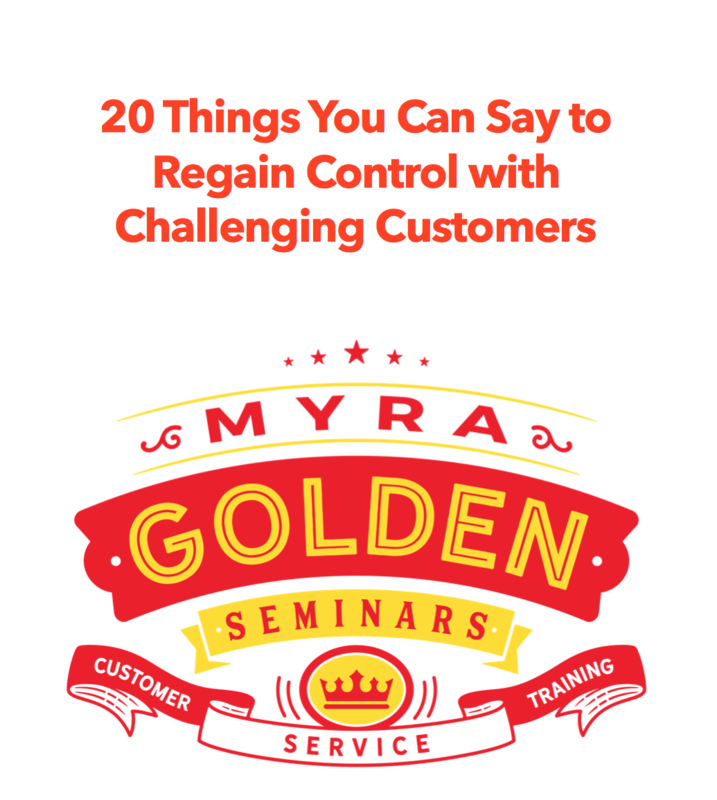 Myra, a former global head of customer care, teaches leaders how to achieve harmony with dissatisfied and difficult customers through the use of empathy, conversational aikido and a solid recovery strategy. The outcome of this keynote is an audience that is prepared to develop a customer-recovery plan that empowers customer service professionals to understand how to create calm; how to find resolutions that balance the interests of the customer and the company; how to reduce escalations; and how to create a positive conversation. Former Director, Customer Service, Audit, Admin at The Scotts Miracle-Gro Co. Learn exactly what it takes to restore customer confidence and regain goodwill after a service failure. Examine the 6 steps for a customer recovery plan that empowers employees with excellent decision-making and judgment skills, resolves problems at the first encounter and restores customer trust. Discover how your employees can communicate assertively, create calm and take control with difficult customers by using conversational aikido. Execute your new customer recovery strategy faster by using a new fiercely focused project plan that gets all of your horses going in the same direction. This video is about How to Preempt an Escalation to a Supervisor or Manager using Myra’s Verbal Aikido techniques participants learn in Myra’s Verbal Aikido workshop.